We’re conditioned at a very young age to believe that if we follow the food pyramid/plate, we’re going to be a-ok nutritionally; but I got news for you, what’s good for you is not necessarily going to be good for me. You may do better on a vegan diet than I ever will, my body may be fueled by fats, whereas every time you have fats you may feel bloated and funky. This is normal. Everyone needs a slightly different amount of micro and macro nutrients in order to be at their best. Trick is, how do we figure out what those micro and macro nutrients are? [source] It begins with understanding how your body works, listening to what your body is trying to tell you, and making small shifts here and there until we find the sweet spot. 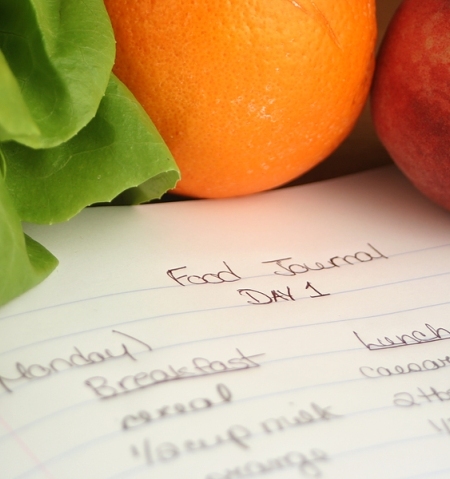 As part of my shifting gears and staying motivated project, I’ve found that in order for me to make the most of my diet and maintain a heightened awareness when it comes to my food choices, food journaling is the key. I’ve challenged myself over the last week to track everything I eat in my food journal to make it easier for me to put all the nutritional pieces together. When I’d mentioned this on the weekend, many of you were interested to learn more, so here it is! 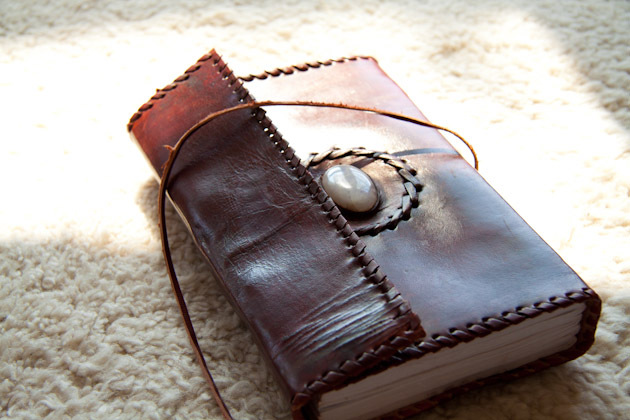 An open mind and forgiving heart – just write it all down! You don’t have to carry your food journal around with you everywhere. Keep it at the office, at home, in the car, whatever works best for you. 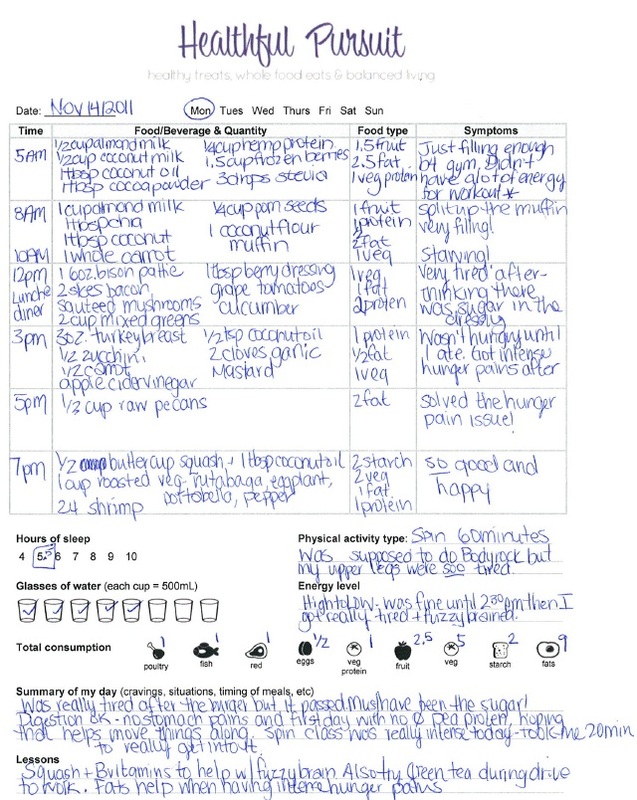 Set aside a couple of minutes a day to enter your foods into your journal and keep track of how you feel after you eat; how you feel after a meal is the most important part and will tell you far more than you realize. See the attached pdf to print your very own food journal! Begin with the date, circle the day of the week it is (this will come in handy when you start to link together your eating patterns) and record your weight, if that is of interest to you. Track the time, quantity (roughly), food, type of food – fruit, vegetable, protein, fat, etc, and the symptoms you experienced after your meal. 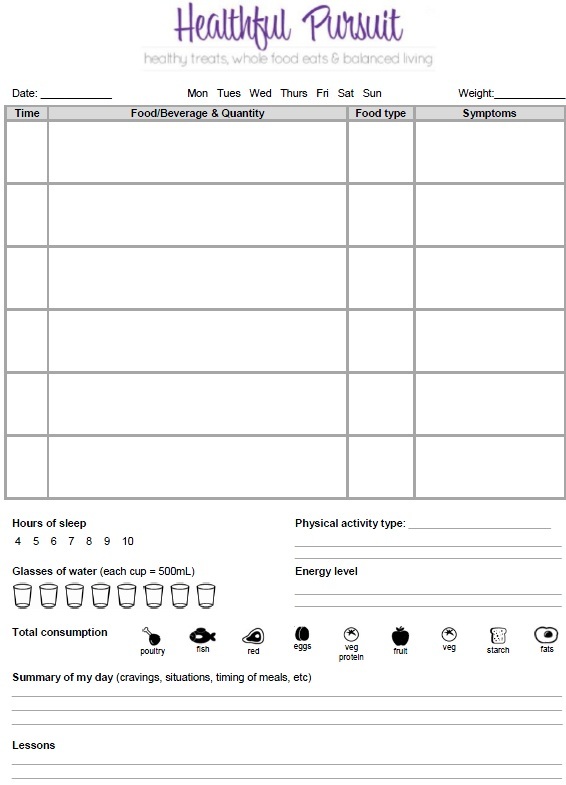 At the end of the day, input the hours of sleep, activities, water, overall energy level, and sum up your total intake. Lastly, jot down a summary of your day, and anything you learned about yourself that day. Here’s one of the pages from my journal as an example. Excuse the messy writing, yours will look like this too, promise. Please understand that there are no bad foods or bad days, and that these days are just as important to report as the good days. Remember that guilty days where we feel like we’ve cheated our body are only bad patterns that come to the forefront when we’re journaling. It’s important that we record each and every thing, no matter how we feel about ourselves during/after we ate it. 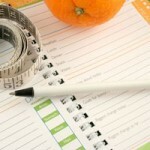 The whole reason behind food journaling is to begin to understand why we made these choices, so write it all down! 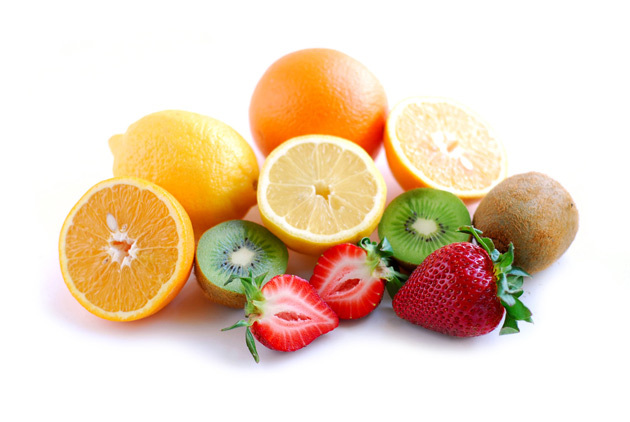 How many fruits, vegetables, proteins are you getting on a daily basis? Are there days where you had more of one type of food that you felt better than other days? Are you skipping meals and subsequently overeating later in the day? Are your meals balanced? Are you eating all of your starchy foods in the morning and packing in the protein in the afternoon? Do you notice any food groups that are completely missing? Do you notice you overeat if you wait too long in between your meals? What is the perfect amount of time between each of your meals? What is too long, what is too short? Do you get a particular symptom after eating a certain type of food? What is the ideal day for you? What patterns were you following that day? Why did you feel so good? Is there a meal that you may have too often? When you consider the day as a whole, is most of what’s being consumed whole, unprocessed food or is it primarily packaged? Remember to take my B complex daily. It really helps with brain fuzziness. Try to have at least 1 vegetable protein per day, preferably in the morning. Increase protein during my morning snack, maybe with stevia sweetened coconut flour muffins? I refer back to this list on a daily basis to make sure that I’m setting some of the learnings into action! Food journaling has already been so useful in helping me understand the weaknesses in my diet, areas for improvement and my strengths when it comes to making healthful choices that are right for my body. If you struggle with not fully understanding what to do next with your own diet, I encourage you to take on the challenge! I’ll report back soon on my progress, learnings and struggles as the weeks go on and would love for you to share, too!